[Eduard Ros] wrote in to show off the latest version of his Arduino powered autonomous rover (translated). You may remember seeing the first version of the build back in June. 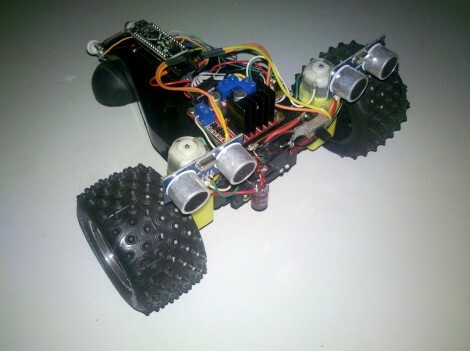 It started with a remote control truck body, adding an Arduino and some ultrasonic sensors for obstacle avoidance. The two big wheels and the pair of sensors look familiar, but most of the other components are a different from that version. The biggest change is the transition from four wheels to just three. This let him drop the servo motor which controlled steering. At first glance we though this thing was going to pop some mad wheelies, but the direction of travel actually drags the third wheel being the larger two. The motors themselves are different, this time depending on gear-reduced DC motors. The motor H-bridge is the same, but [Eduard] used a simple transistor-based inverter to reduce the number of pins needed to activate it from two down to just one. He also moved from an Arduino Uno to a Nano to reduce the footprint of the controller.